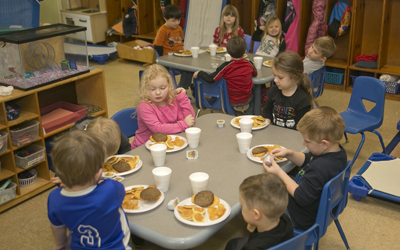 First Baptist Church Children’s Center has been a part of the Marion Community since it opened on July 11, 1966 as the first state licensed daycare in McDowell County. As a mission of First Baptist Church of Marion, the center seeks to provide the best care for all the children of McDowell County. The center is owned and operated by First Baptist Church under the oversight of a Board of Directors comprised of 9 church members and the management of the Center’s director and staff. The pastoral staff of the church also provides vital support to the Center. All of these leaders in FBCC seek to provide a safe and nurturing environment for children that is shaped by our Christian beliefs. We believe that children are a gift of God. Therefore, we rejoice at the opportunity to minister to these children and their families, sharing the love of God in the name and spirit of Jesus Christ. First Baptist Church Children’s Center was originally opened to provide child care for 42 children. Currently, FBCC provides care for up to 99 children, age 2½ to 12. The center provides full-time, drop-in, and before and after school care, as well as full-time summer care for school-age children. FBCC has competitive rates for McDowell County and also works with local subsidy programs to provide care for all children in need. The Children’s Center participates with CACFP, a federal food program that provides reimbursement for meals served at the center. Also, FBCC participates in the state funded TEACH program that helps fund continuing education for the teachers. The director of First Baptist Children’s Center is Mary Lewis. 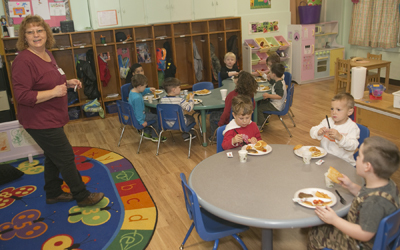 The center has nine full time staff members, all of which have a minimum two-year degree in childcare. First Baptist Children’s Center is PROUD to be a state licensed 5 star center (the highest certification by the State of North Carolina!). 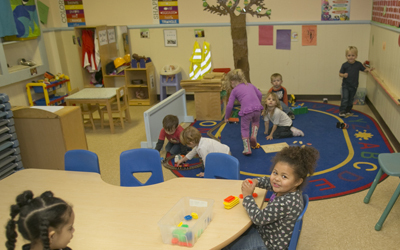 To maintain a five star rating, the center must meet staff education requirements, pass several state (NAEYC) and county inspections, and comply with ECKERS and SACERS evaluations. In addition, FBCC has been voted as the #1 Childcare Center in McDowell County for the last three years and many years prior. The staff of First Baptist Children’s Center of Marion looks forward to continuing to offer superior childcare for many years to come. For more information about the Center, please contact FBCC.